The Aviva Dispenser Shower Basket in Chrome restores order to your showering space. Equipped with two dispensers to allocate shampoos, gels, conditioners and other liquid cleansers in proportionate amounts, this unit eliminates waste and spillage often associated with poorly designed and cumbersome bottles. It does not require any drilling of your shower walls and installs easily with the included adhesive strips and silicone glue. A chrome wire basket and four hooks allow storage of other bathing accessories to maximize space utilization and keep your space neatly organized. The AVIVA Dispenser Shower Basket in White restores order to your showering space. Equipped with two dispensers to allocate shampoos, gels, conditioners and other liquid cleansers in proportionate amounts, this unit eliminates waste and spillage often associated with poorly designed and cumbersome bottles. It does not require any drilling of your shower walls and installs easily with the included adhesive strips and silicone glue. A chrome wire basket and four hooks allow storage of other bathing accessories to maximize space utilization and keep your space neatly organized. Stylish and practical, the Fine Line 2-Tier Basket provides an elegant solution to organize your shower area. This generously sized shower caddy can be installed onto any surface without the use of tools, using waterproof silicone glue for a secure bond. The 2-Tier Basket includes optional accessory hooks for even more storage possibilities. A most attractive combination of design and practicality for organized bath. Medium Shower Basket in Polished Stainless This medium shower basket mounts securely into the corner of your shower to provide stylish and convenient storage. Made of premium stainless steel, it provides years of durable and corrosion-resistant use. 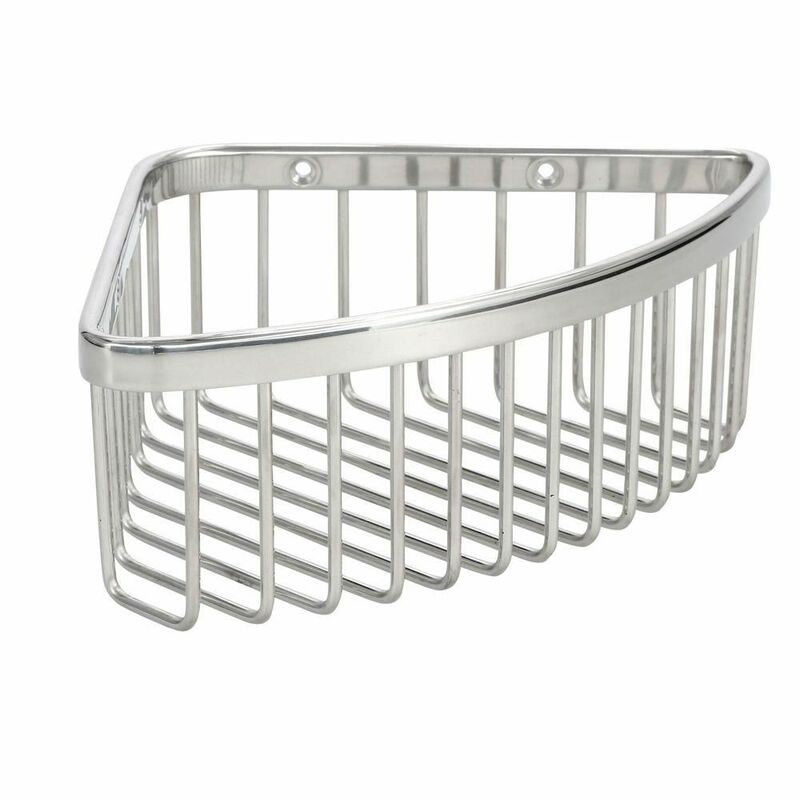 Medium Shower Basket in Polished Stainless is rated 4.4 out of 5 by 9. Rated 5 out of 5 by sandytoesFL from Very nice, attractive and well made shower wall basket. ... Very nice, attractive and well made shower wall basket. Very similar, if not the same, as those seen in nicer hotels. For tub/shower remodels, this is a much faster and easier solution than 'recessed cubbies'. Very pleased with purchase. Rated 3 out of 5 by Maureen from The quality of this basket is quite good. However, it is stainless steel and did not match all t... The quality of this basket is quite good. However, it is stainless steel and did not match all the polished chrome in the shower. I was able to find polished chrome baskets at a similar price point. Rated 5 out of 5 by Neal from Love these. Love these. Rated 4 out of 5 by Whyy from Good Basket, Difficult Mount There should have been anchors included to mount the basket to tile. Rated 4 out of 5 by Pappy from Excellent quality. The shelves are definitely harder to install than average, so make sure you have everything needed prior to starting. They are sturdy and good looking. Pleased with the way they look and based on the quality I am sure they will hold up well. Rated 5 out of 5 by Spider from classy looking baskets We bought two baskets so that our kids could each use one for shampoo and soap without cluttering up the bathtub rim. They were installed by our contractor with no problems. They are well constructed and there were no defects. We ordered chrome but they do not exactly match our faucets, to me they look a little less silver than chrome, but they are close enough that it isn't a problem.